Located in a rural farming and ranching community in the San Luis Valley, this school is designed with many bioclimatic and environmentally responsive features. The climate in this region, classified as zone 6B by ASHRAE, is generally heating dominated. While temperatures in the summer can reach 86° F, diurnal temperature swings as high as 30°F can provide free daytime cooling via passive strategies. Common spaces like the entry lobby and hallways are fully-glazed and oriented south to maximize passive solar heating potential. Exposed concrete floors and CMU walls provide thermal mass, so heat stored by the building during a summer day can be dissipated via automated louvers and rooftop exhaust fans at nighttime. Large thermal curtains expand over the glazed walls to help retain stored heat in the winter. Radiant slabs are used for supplemental heating in classrooms and offices. 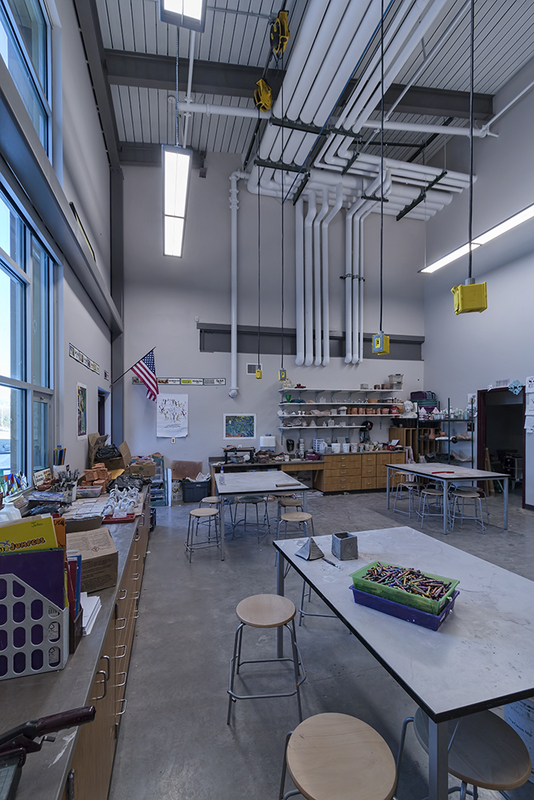 Classrooms receive high quality glare free northern light, minimizing the need for shades or supplemental summertime cooling. Tubular daylight devices and clerestory windows allow for ample daylight and limit the need for artificial light. The placement of the building also considered prevailing wind patterns and strives to maximize natural ventilation while minimizing turbulent conditions in outdoor play areas. 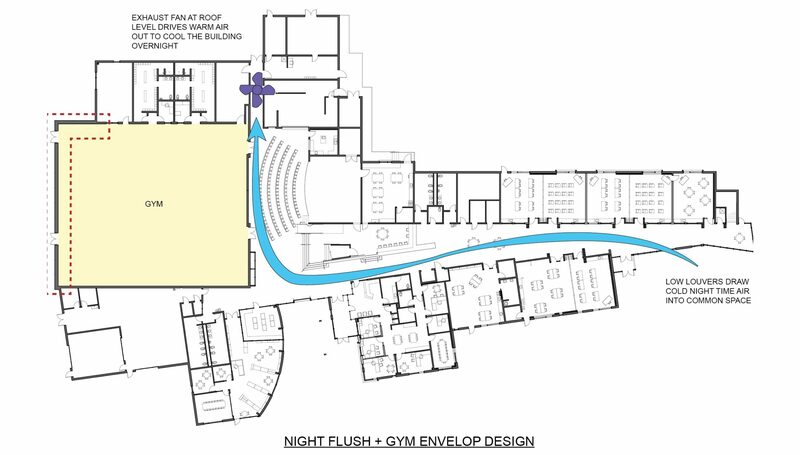 Unique to this building was an approach that incorporated Passive House concepts, combined with radically simplified HVAC systems for the Gymnasium. As is typical of most schools gymnasiums, the occupant loads can be large, but the frequency is small. Our team’s extensive work in K-12 design identified this as a potential area of innovation. Rather than provide the typical energy efficient (but costly) HVAC approach, the team evaluated the effectiveness of super-insulating the building envelope and simplifying the HVAC systems to both improve energy performance as well as save first costs. The design team looked at Passive House standards for insulation and air tightness, ultimately incorporating an R-46 wall assembly, over 3.5 times greater than the code requirement. The super-insulated envelope holds heat extremely effectively in this cold climate, and simple, fan-driven night flushing is used as a cooling strategy during the infrequent events, mostly held at night when outside air temperatures allow for free cooling.